Transpose the ambiance of 31, rue Cambon without copying every detail. 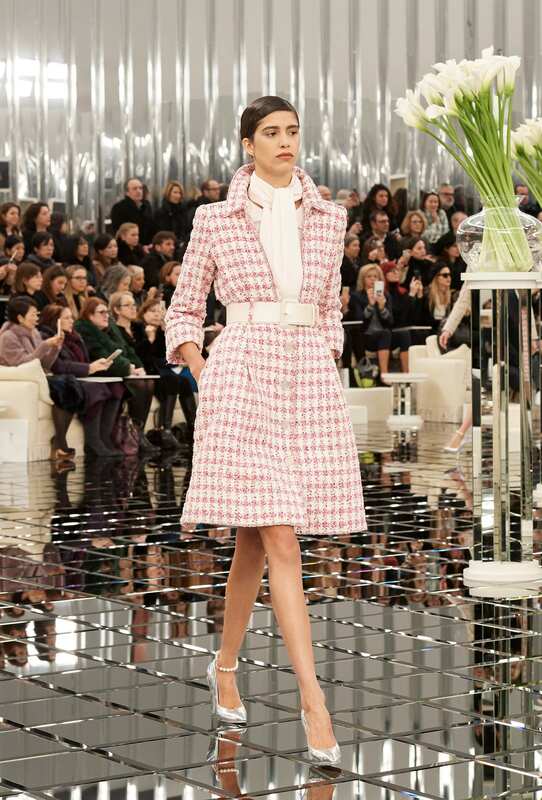 That’s what Karl Lagerfeld had in mind for the presentation of the Spring-Summer 2017 Haute Couture collection at the Grand Palais. 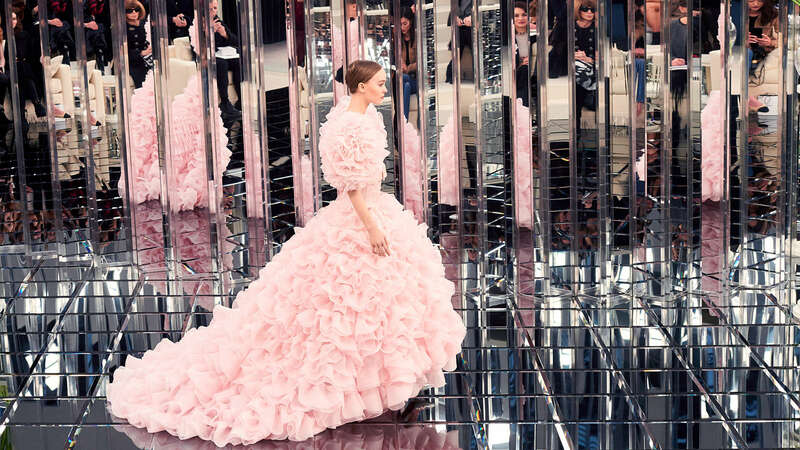 In a décor inspired by the 1930’s and Art Deco, the setting recalls the mirrors that reflect the grand staircase leading up to the CHANEL Haute Couture salons. This time it’s the beige sofas that seem to have multiplied. On the same principle a large cylinder acts as a kaleidoscope in the midst of the runway: in front of it, the models appear to pass by infinitely, their silhouettes also reflecting in the smoky mirrored tiles engraved with the iconic quilting motif. 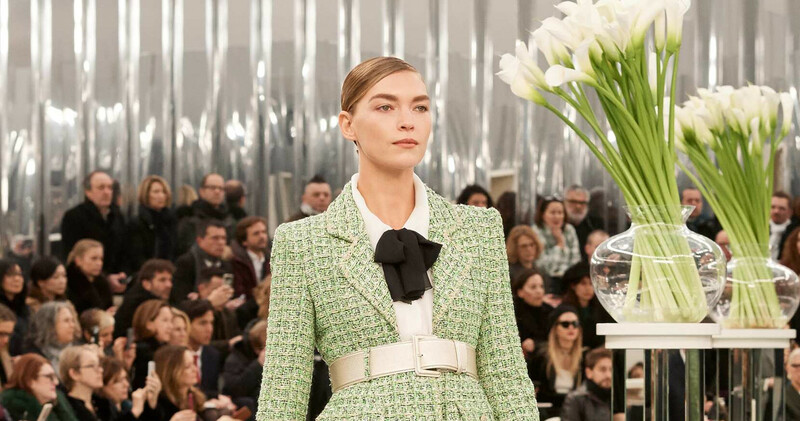 With slicked back hair and a “flattened” top hat tilted backwards, and silver-leather high heels or thigh boots, this season’s look is all about a crazy femininity: with structured shoulders, defined and slightly raised waists, it reveals the accentuated hips. A glamorous silhouette reinforced by the presence of straight or tubular lines, daringly low-cut décolletés and faux pearl jewellery transformed into anklets. Alongside the major hues of white, silver and grey, the palette – illuminated each time with metallic, silver, sparkling and iridescent notes – blows hot and cold, moving from beige, pink, yellow, blue and pastel green through to black and navy. With great delicacy, the tweed suits with embroidered braid are draped at the waist, thus enhancing the curves of their tulip skirts. 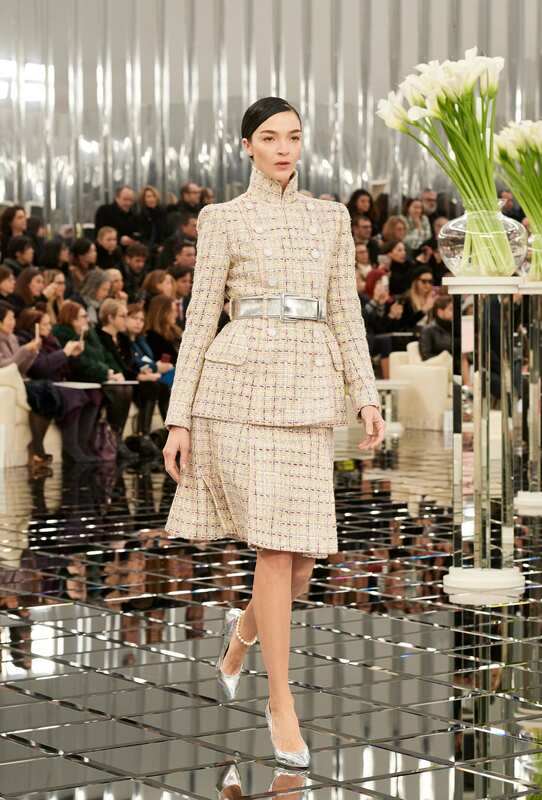 Playing with trompe l’oeil they become dress-coats, the jacket appearing to be tucked into a pencil skirt. At the back, ample golf pleats ensure the utmost comfort. Just as feminine and worn with tweed jackets, the dresses with officer or lavallière collars are dressed up in shimmering tones. 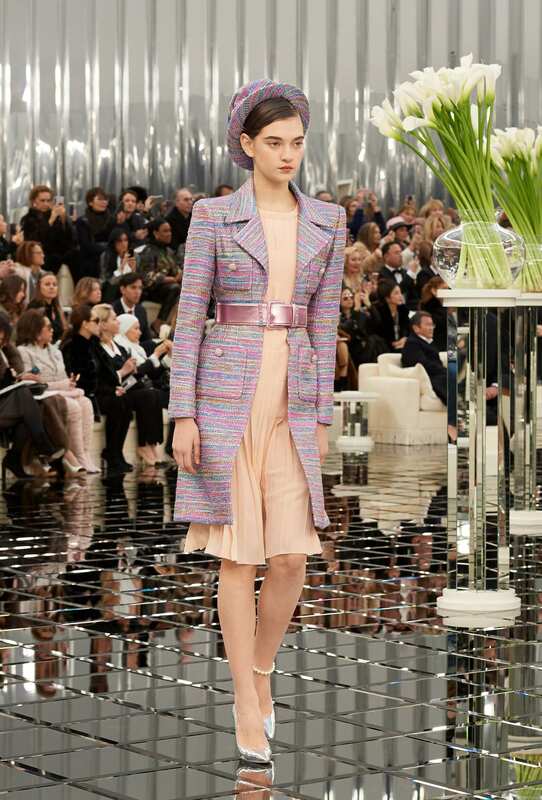 Pleated skirts and dresses are paired with coats in iridescent tweeds. For evening, the silhouettes come swathed in radzimir, duchess satin, organza and taffetas, flocked and laminated lace, tulle, jacquard and georgette. The pearlised floral embroideries and glittering faceted stones shine over the sheath dresses and those with more generous volumes occasionally kept warm with stoles in tulle, feathers and lace. Sheath dresses take turns at being enveloped in floor-skimming mirrored embroidery, strips of sequin embellished lace, or balls of feathers. 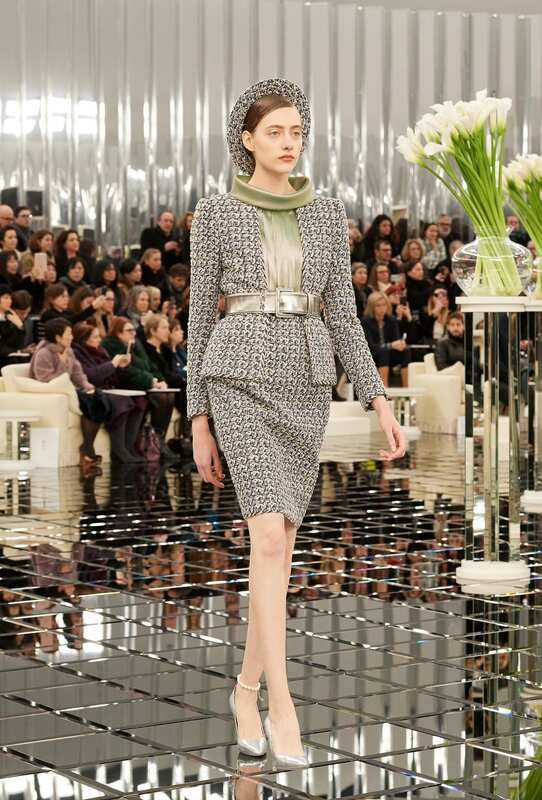 Draped bustiers embroidered with rhodoid flowers and leaves, big skirts and dresses in tulle, deep and square-cut necklines plunging to the start of the waist and marabou boleros: a delicate and gracious sensuality seizes this collection that concludes with the arrival of CHANEL ambassador Lily Rose Depp who walks the runway in a wedding gown composed of diaphanous flounces in pale pink organza.